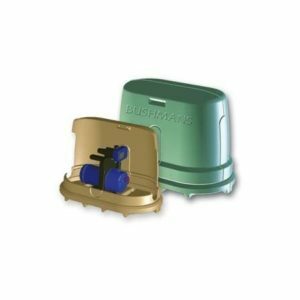 For larger homes or where there is a need for larger volumes of water the BIA-BHM3-4MPCX water pump can supply up to 9 taps with running water. The pump has a powerful 1kw (1.36HP) electric motor which provides up to 72 litres per minute of water. The maximum head it can push up is 36 metres and it has a pressure controller and the ports are 25mm BSP female in and 25mm BSP male out. 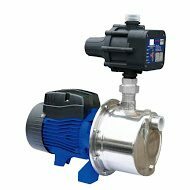 One of the key features of this pump is the pressure control unit regulates the pump so when a tap is turned on the pump starts and this ensures constant pressure throughout the system. The pump also switches off if the tank runs dry. The best place to locate the pump is next to the tank however it can be located away from the tank and next to power if required. Ideally the pump should be placed so the suction is flooded to maximise volume and pressure. The BIA-BHM3-4MPCX is well suited to household use where multiple taps may be switched on at the same time. The pump can be for household use, for activities around the garden, washing of outdoor areas or for use around the shed. The pump should be housed inside a pump cover or positioned inside a building to shield it from the weather and this will make sure the life of the pump is not adversely affected of damage from rain or sun.